Claire Robinson, the hot new Food Network star of 5 Ingredient Fix and Food Network Challenge, helps people get dinner on the table with little fuss and a few great ingredients. The quest for simple, affordable, and fresh, mouthwatering food is over. 5 INGREDIENT FIX helps put delicious and sophisticated meals on the table in a snap. With people struggling to simplify, streamline, and budget, the Food Network’s Claire Robinson is here to help. Cooking doesn’t have to be complicated to be impressive; simplifying the process with fewer ingredients saves time, frustration, and ultimately, money. From breakfast treats like Brioche French Toast with Strawberries and Cream to no-fuss meals like Grown-up Grilled Cheese and Iceberg Wedges with Buttermilk Dressing to a romantic dinner of Grilled Scallops with Saffron Aioli and Green Goddess Rice, all of Robinson’s recipes have five or fewer ingredients. A quick trip to the supermarket for one bag of groceries, and a delicious, restaurant-quality meal can be on the table in no time. Claire Robinson is the host of Food Network’s 5 Ingredient Fix and the daily primetime series Food Network Challenge. Claire cites her French-speaking grandmother as a major influence on her love for food. Claire graduated from the French Culinary Institute, is an accomplished private chef, and has worked on culinary production teams for several cooking series’, including Food Network’s Easy Entertaining with Michael Chiarello. 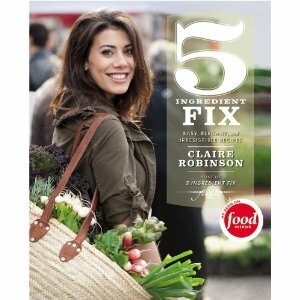 Robinson is the host of 5 Ingredient Fix on Food Network and one that I watch religiously. In this new cookbook, she puts on paper a lot of her favorites for you to try. 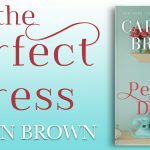 This is such a beautiful cookbook, full of easy to use recipes and beautiful pictures. I tried several and the one that is most favored in my house is the grown up grilled cheese made with cheese that doesn’t come wrapped in cellophane. I even tried my hand at creating my own 5 Ingredient Fix. Cook Time about 30 minutes at 350. This can be prepared ahead and refrigerated, just add 10 minutes cook time. I use a small ladle to place about 4 scoops of Enchilada sauce in the bottom of the pan. Place 6 tortillas over the bottom of the dish like Lasagna noodles, they will overlap. Coat the top of the tortillas with a few more ladles of sauce. Place 6 more tortillas after coating both sides with sauce. I usually ladle a bit on the bottom of each and coat as best as possible. Ladle extra on the top. You should have about 1/3 can of sauce left. Repeat the cheese, chicken, onion, cheese step above. Place the final tortillas on top of this after coating both sides with sauce. Sprinkle the remainder of cheese on top with some of the onions and whatever sauce is left. Bake at 350 for about 30 minutes, add about 10 minutes to baking time if you refrigerated it. This is almost better the next night. It will keep in the refrigerator for 3 days. You can also make this with turkey, pork and hamburger. I would recommend lightly dusting salt and pepper over the meat as it is cooking. I serve it with corn mixed with a few red bell peppers finely chopped and Spanish rice made from a box. Now this looks like an extremely useful cookbook! The recipe looks so easy and doable! Very important on busy nights! Thanks for the info.